In 2018 Estonia is celebrating its 100th anniversary – EV100. 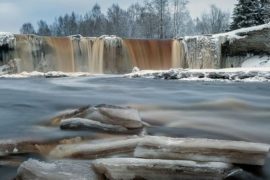 In this blog we introduce beautiful places, activities and things to do in Estonia, so you’d have a chance to spend your days here to the fullest and celebrate with us. Even though our capital is rather small compared to other European cities, there is much to see here. 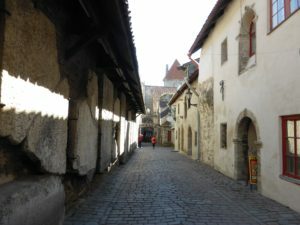 If you’re wondering about possible things to do in Tallinn, have no worries – this blog post will help you plan your travels and sightseeing with giving an overview of the absolute must see places in Tallinn. Tallinn, the capital of Estonia with almost 450 000 people living here, is the brightest pearl in this tiny country. The first traces of human life in the area date back more than 5000 years. 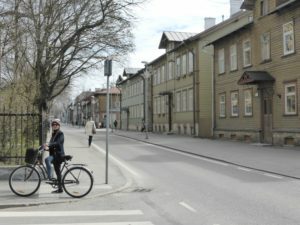 Nowadays the modern Nordic city is rich with a mixture of medieval Baltic history and influences from our Soviet past. The Old Town is definitely one of the essentials. 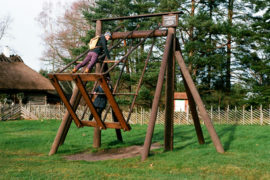 Its well-preserved, picturesque streets, town wall and houses can be up to 700 years old. The charming Old Town belongs to the UNESCO World Heritage List and taking a stroll there feels like you’ve ended up in a mushy fairy tale. The Old Town is packed with hidden gems and quaint corners, together with must-see top attractions. You cannot leave the Old Town before you have been to the Town Hall Square. Since it’s in the very heart of the Old Town, you’ll inevitably end up there even if you’re not sure of its exact location. Throughout the centuries, it has been the main market square and it is now surrounded by restaurants with all kinds international cuisine. Every year there are several events held on the square with the biggest and the most famous being the Christmas Market. Estonians like to believe that the very first Christmas tree in Europe was erected there too, but our good neighbours the Latvians down south would probably protest about this. 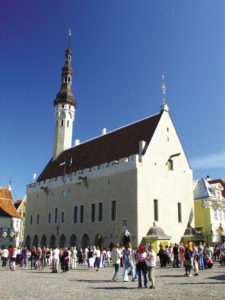 The Town Hall building is the only preserved Gothic-style Town Hall in Northern Europe, dating back to the 15th century. While you’re admiring the Town Hall, look at the very top of the spire, where you can see our city symbol and guardian Old Thomas. He has been hanging out up there for around 500 years. Only a couple of minutes’ walk away from the Town Hall Square, you can find Catherine’s Passage. It truly is a fascinating and the most romantic-looking tiny street, filled with cosy craft workshops and… well, 400-year-old tombstones (but it still looks very homey there). Locals artisans create and sell their wares such as hats, glassware, ceramics, silk scarves and so on. You can even witness the artists at work blowing glass, making pottery or weaving. However, there is a catch. Only the very brave, persistent Passage seekers will be able to locate the place since it’s very well hidden and easy to miss. When you find it, you’ll be rewarded with seeing creative local handicraft, a medieval atmosphere and … 400-year-old tombstones on the wall of Catherine’s Church. Good luck! Aleksander Nevsky Cathedral is a magnificent architectural masterpiece on top of Toompea hill and impossible to miss. 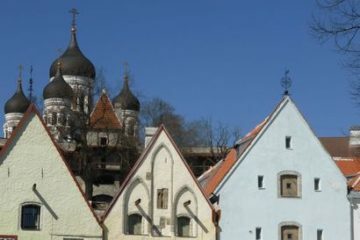 This sightseeing spot is a must be photographed and can be found on almost every postcard of Tallinn Old Town. Ironically, it’s also one of the least Estonian things you can see in Tallinn. 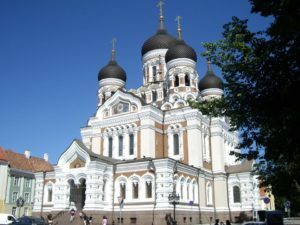 It’s a Russian Orthodox church built while Estonia was part of the Tsardom of Russia. It was erected there as a reminder that the Russian Czar was the boss and to suppress the national awakening the Estonians were having. However, we are still proud of the Cathedral, because even Estonians admit it truly is a respected work of architecture, inside and out. 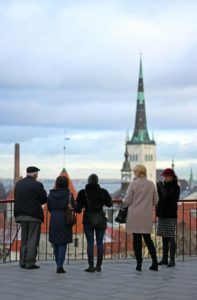 On your walk in Tallinn Old Town, one of the top things to do is visiting the viewing platforms. The most famous and visited platform is Kohtuotsa offering breath-taking panoramic views over the Old Town, the Gulf of Tallinn, cruise ports and more distant areas of the city. It is also a place for selfies with the seagulls, who now and then love to pose for all the flashing cameras. A short walk away from Kohtuotsa is Patkuli viewing platform, unveiling even more of the sea (wow! ), Kalamaja district and the main railway station. Not so crowded and often underestimated, Piiskopi (Bishop’s) viewing platform right behind the Dome church gives you time to relax and enjoy the view. Back in the olden days Kalamaja (in translation: Fish House) was an industrial district. In the 90s, after the Soviet Union collapsed, Kalamaja housed mostly drug dealers, thieves and other crowds at odds with the law. Nowadays it’s the place where every young family wants to own an apartment and where you get an authentic feel of the local lifestyle. Kalamaja, with its bohemian charm, has hundreds of gorgeous, colourful wooden houses, hipster cafes, restaurants, and bakeries mixed with renewed factory houses. You can also find the Maritime Museum at the Sea Plane Harbour. Walk to the very end of the Sea Plane Harbour pier and you’ll have Instagram-worthy pictures of the Tallinn skyline. 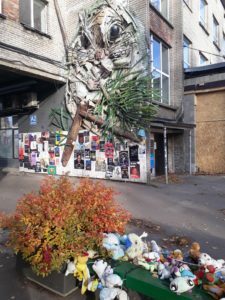 Around 10 years ago, Telliskivi Creative City was little more than an abandoned industrial area with broken windows and hideous graffiti. As we began to understand how trendy it has become to restore old factory areas, a first restaurant popped up. Now you can basically find everything there — offices, NGOs, cafes, restaurants, a yoga studio, a theatre house, a bakery, and a lot of local Estonian design stores. There are more than 500 events taking place in Telliskivi Creative City every year, including a Flea Market every Sunday. 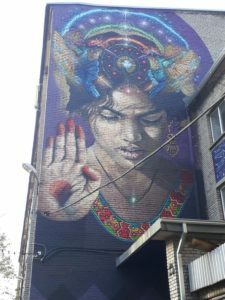 Telliskivi is a place where old meets the new, and another big bonus is that the horrendous graffiti has been replaced with superb street art. 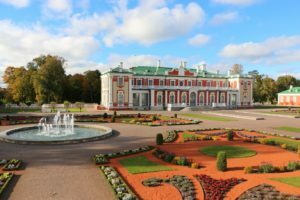 Kadriorg (in translation: Catherine’s Valley), a large region in the city with a romantic park, started to develop when the Russian Czar Peter the Great ordered the Kadriorg Palace to be built there. The Palace was meant as a summer residence for Peter’s family. Unfortunately Peter decided to die before the construction of the Palace was completed. The fancy looking Palace design was inspired by Italian villas. Now an art museum can be found inside, and a couple of hundred meters away is our President’s Palace. 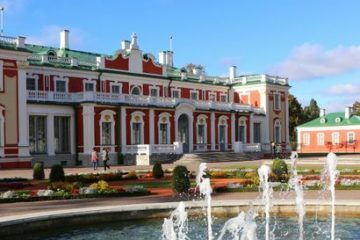 Only a short distance from Kadriorg Palace is the headquarters of the Art Museum. KUMU, a modern architectural masterpiece, was awarded European Museum of the Year in 2008 and is largely an underground construction built inside a natural limestone escarpment. The KUMU building alone is a must see, but it wouldn’t hurt to see the art inside as well. Around 15-minutes’ walk away from Kadriorg you’ll end up at the Song Festival Grounds, which has an important place in every Estonians’ heart. All Estonians believe we sang ourselves free from the Soviet Union. More than 300 000 people gathered at Song Festival Grounds to sing patriotic Estonian songs and, well, miraculously we ended up being a free, independent country in 1991. We celebrate the The Song Festival here every five years with hundreds of choirs and tens of thousands of people participating. With its height of 314m, the TV Tower is the tallest building in Estonia, offering several exhibitions and magnificent views from the top (Instagram, guys!). 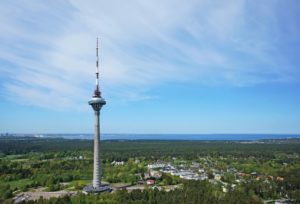 If you want to learn more about re-independence in 1991 and the Estonian Singing Revolution, then the TV Tower is the place to visit in Tallinn. To face your fear of heights, you can book a walk on the edge, or step on glass where 170 m of nothingness is yawning below you. Casual things, you know.